This is a Guest Post by David R, and the second of a series about the need to improve the Western Victoria Quarter. Part 1 can be found here. 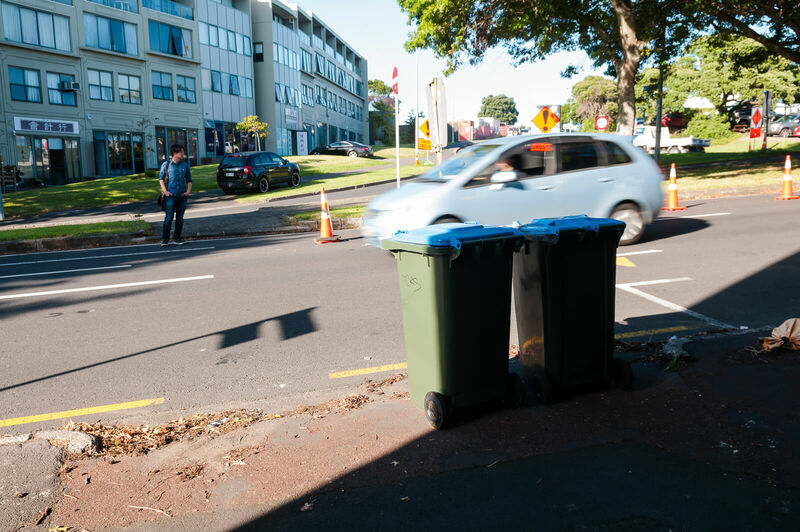 This lack of foresight and common sense was compounded by Auckland city fathers led by former Mayor Sir John Allum, chairman of the bridge authority. He lobbied the National Roads Board to reconfigure State Highway 1 from its previous designated route around the city (ironically about where State Highway 20 is being retrofitted now at enormous cost) to a route directly through the centre of suburban and inner-city Auckland (causing great damage) and on to the bridge. As former National Cabinet minister W.J. (Jack) Scott recalled in May 1999, State Highway 1 was moved because Sir John feared the toll revenue would be insufficient. Sir John, he said, “had never been associated with a failure. No way was he going to run the bridge at a loss.” It was Jack Scott who pointed out that originally the southern and northwestern motorways were meant to be linked as ring road around the city – not slicing through it. Michael Lee (Jun 1, 2009). Michael Lee: Sins of the fathers – legacy of harbour bridge. 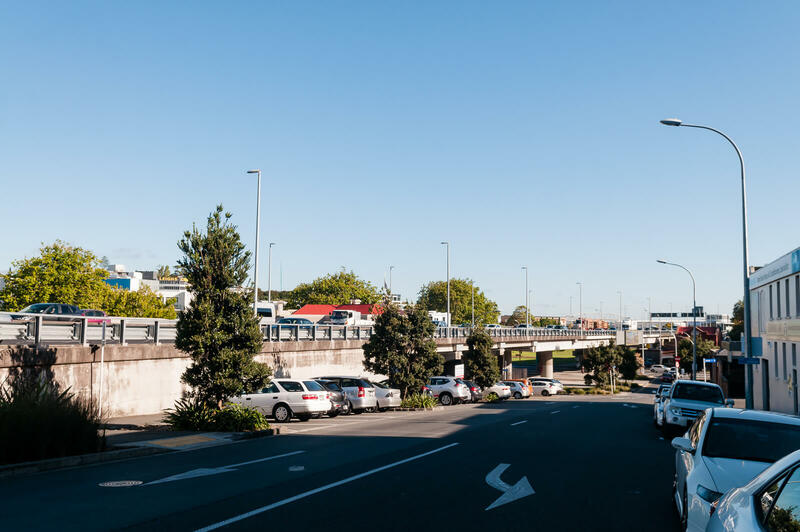 Of course, anywhere the motorway went through would have the same fate – perhaps it is unfair to throw Westmere and Ponsonby under that particular bus. At the 1953 mayoral election, Allum was defeated by J. H. Luxford who claimed the bridge would place untold costs on ratepayers for upgrading roads. John Roughan (Aug 27, 2010). Auckland: The bridge builders. Beyond the removal of the northbound offramp into Franklin Road and the realignment of Union Street to make space for a carpark at the end of Sale Street, this is pretty much what we have today. The best case is the removal of the viaducts as part of a road AWHC crossing. In 30 years. In the meantime, there is a surface level motorway passing through, with nothing to mitigate the noise or pollution it causes. Conversely, I feel that Cook Street is something that can be changed today. It is, of course, possible to cross at any point. But due to the blind rise, the number of lanes (three, for a single lane offramp), the high speed of vehicles exiting the motorway, a lack of signalling and sudden lane changes, this is never safe and I’d wager impossible for children, the disabled, the elderly or anyone not willing to run across. There is an allocated crossing at the point with least visibility near Sam Wrigley Street, pictured below. Cars may park in the marked spaces at the bottom right of this image, directly in front of the crossing, further reducing visibility. The kerbs here are, pointlessly, inaccessible to wheelchairs and an obstacle to prams, especially with cars bearing down well above the marked speed limit. Once you’ve crossed onto the traffic island, further difficulties arise crossing North to Placemakers or the South to residential units. Going North, cars are turning at high speeds around the sweeping right turn, usually without indicating from a ‘straight+turn’ lane, over a blind rise. 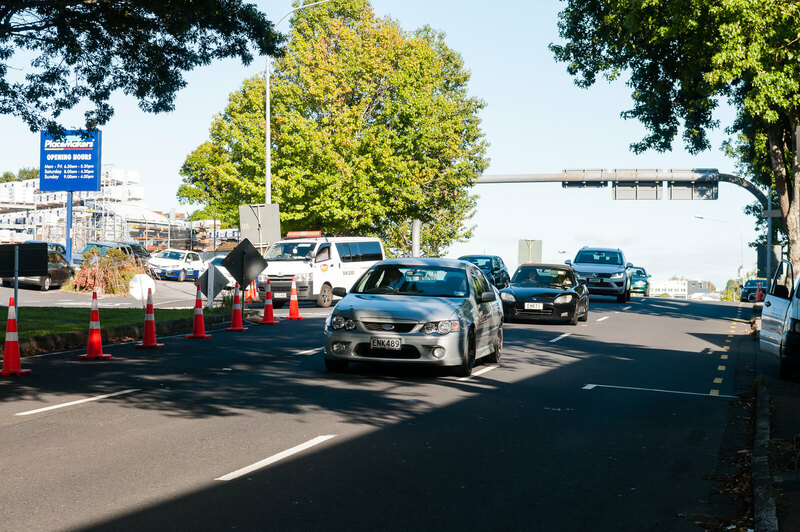 This traffic is then mixed in with traffic exiting from (and around) Placemakers that will be checking for speeding cars to their left, not pedestrians attempting to cross on their right. Sam Wrigley is made up of two sweeping turns merging into one. 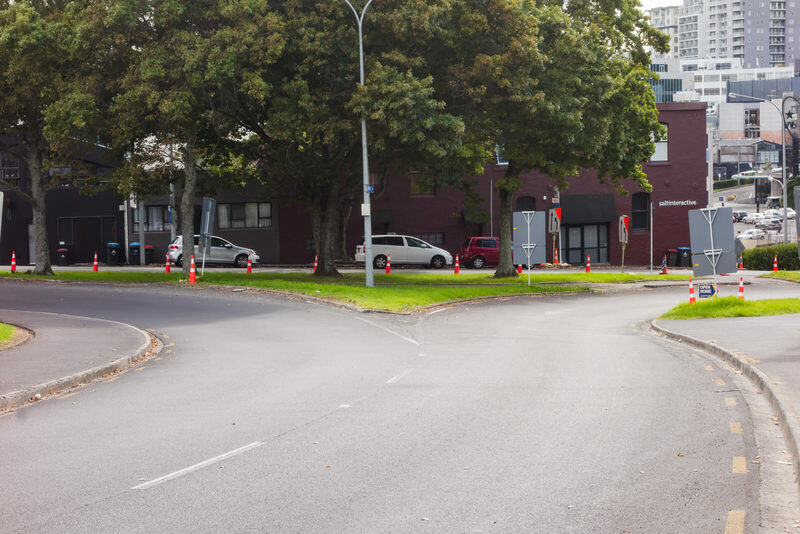 It is clear in the image below that the width of both roads is very wide and intended to allow cars to negotiate the corners at high speeds, with no consideration for pedestrian needs. Stop getting in the way of cars, jerk! 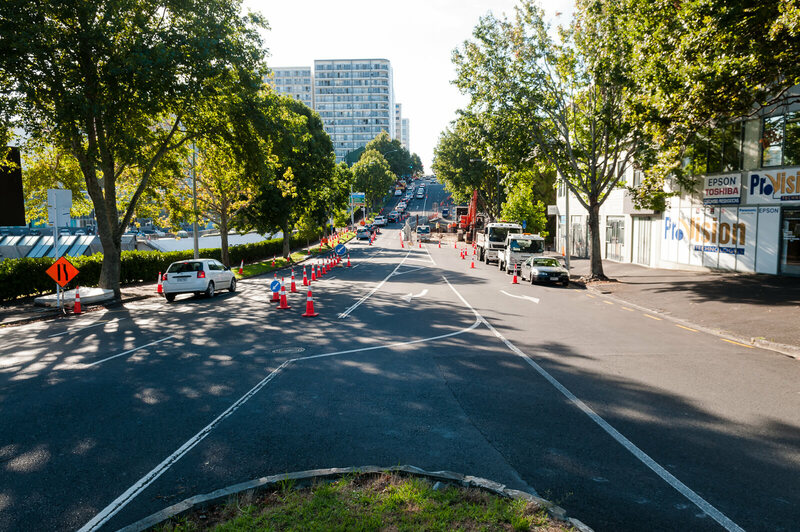 To cross Cook Street at a safe, controlled intersection requires a detour of around 700m – 350m each way to Nelson Street and back, around 10 minutes. 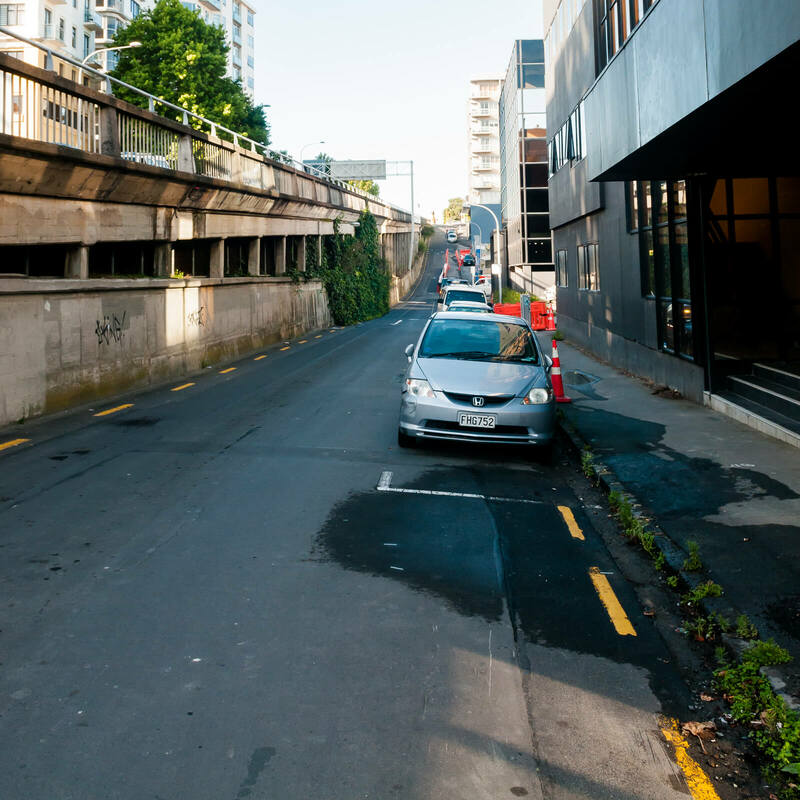 Or you could opt to head up Nelson Street, if that works for you, within this rather bleak streetscape. Many opt instead to use the separated Nelson Street bike lane. 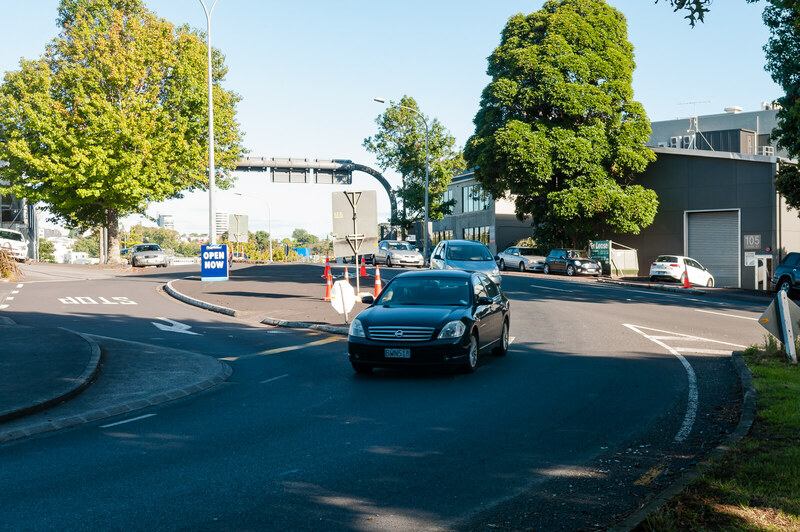 The only proposed changes to Cook Street are related to the SH1 Additional Waitematā Harbour Crossing project, which ATAP has now aligned with the third decade, meaning 20-30 years of the status quo (Unless a future government rams it through regardless). 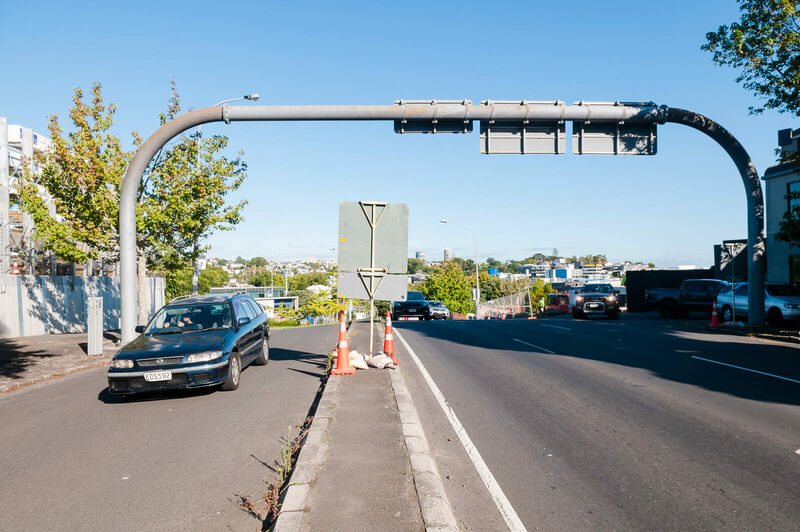 One of the proposed solution results in a tunnel portal which will be a blight on the area, along with the proposed roads not taking into account existing local building access on Cook Street. Nothing in this design considers the wider goals for the area, primarily focusing on ease of access to motor vehicles into the central city two decades from now, though it would at least permit safe crossing of Cook Street if the proposed link road between Sale and Union Streets has the radius tightened. The previously proposed realignment of the off-ramp up Union Street would have solved this issue (and by solved I mean made it someone else’s problem, though Grade separation of Union Street is much simpler than on Cook Street), but Auckland Council sold the Union Street car park to NZTA to use as the Central Incident Response Centre and it’s not clear who is really in charge of what happens in this area. The current arrangement is here simply because no one ever changed anything. Cook Street has been this wide since its inception, with the same blind rise. There is no modelling that decided it needed to be this many lanes of traffic – when Cook street was turned into an offramp in the 60s, all that width was used solely because it existed – if one lane was enough, but there was space for more, then why not have as many as possible? In lieu of anything changing and the AWHC being decades away (assuming it brings with it any positive change), we need a solution to address the severance caused by Cook Street and the Motorway. Most of this is already identified and discussed in the CCMP and District Plan. But where are the actual, tangible, timelined plans to do anything? How are brownfield sites ever going to compete with new suburbs if Auckland Council and Auckland Transport treat the non-vehicle users of these areas with such disdain? Next time I’ll be covering vehicle priority and pedestrian design failures in area. 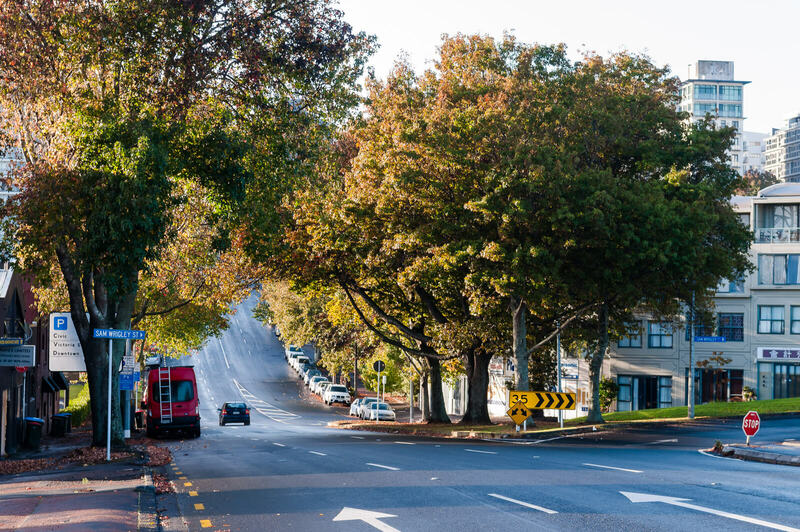 Thanks – I lived in the area for several years when I came to NZ, and even as a young fit man, the environment’s hostility to just walking or cycling down to Victoria Park was (and remains) staggering. From traffic lights that dont provide pedestrian phases even when they would conflict with no car movements to lack of footpaths to things you already mentioned like the speeding and extra lanes. Apparently nothing at all needs to be done at all. The Council’s propaganda says it costs $146,000 per house for infrastructure in greenfields areas but the city centre already has most of these facilities in place. You’d very likely find that many of the changes advocated here would be dirt cheap, especially on a City Centre household density basis. And if you add the HIDDEN infra costs for sprawl infra – i.e. those of upgrading the routes between wherever people work, and the far-flung places they will live – your calculation gets even better. So while its clearly not nothing to upgrade existing infra, the case remains very strong. And you can do a lot pretty cheap once you agree that the car doesn’t need numerous lanes everywhere. A lot of the costs I can see above such as a pedestrian bridge across the motorway and sound proofing should be coming out of the cost of these through roads the serve sprawl further out. Right, so one building alone on Cook St (the Grace Victoria Quarter) with 107 homes gives us a budget of $16m at that rate. The Union Green going in just around the corner adds $22m, and the SugarTree next door adds another $21m. So those three buildings within a few hundred metres of each other have saved $69m in sprawl infrastructure costs. Good deal, sounds like a few pram ramps, and couple new pedestrian crossings and some footpath extensions might be a better deal no? Sounds like a plan to me. Send the owners of those apartments a bill for $146,000 each and have anything you want. Nah, we need to send a bill to the developers building car-dependent developments on the outskirts. What about close the Cook Street off ramp and make Union Street two ways. A lot of things make total sense once you realise how hostile the street grid over there is. ❧ People sometimes refer to apartment blocks as those slums. Strictly speaking that’s incorrect usage of the word ‘slum’, but I don’t think a lot of people who live there would be there if they could afford something else. ❧ People fight any hint of density tooth and nail. Well, here’s your showcase. Would you like your suburb to turn into this? If you still don’t understand why after reading this series, you’ll probably never understand. ❧ Once you have kids, it’s time to move on. What’s in it for kids? A small apartment, not much in the way of usable common ground, and “outside” is too dangerous. For adults, crossing slip lanes and side streets with high speed turns (like Sale Street) is annoying but at least possible. Children cannot do this at all because they can’t judge the speed of oncoming traffic (brain development still in progress). Of course this is true in suburbs as well, but that’s where the backyard and the larger house come in. So what to do? There seems to be total apathy at the council, AT, etc. There may be a CCMP, or whatever. Actions speak louder than words. Meanwhile, think long and hard before you recommend anyone he should look into apartments. That’s is indeed the best case scenario. And maximum respect for putting this submission together. Any effort advocating for higher density etc. will be totally wasted if we don’t get this right. Did you get any more response on that submission? No, but I’ve not given up! Just FYI, lots of people (including families) do now choose to live here, in quality apartments, with plenty of space, and pleasant common grounds (thanks SugarTree). We don’t live here because we can’t afford anything else. We choose to live here because we’ve seen examples overseas of how awesome central city apartment living can be when done right. We live on a cycleway, 3 mins walk from primary school, within walking distance of parks, shops, cafes art gallery, waterfront, playgrounds. And a short bus or train ride from here to loads of cool places, such as the museum. Just stand at the corner of Nelson and Hobson at 8.30am and watch the streams of families with kids making their way to daycare and school. So we definitely need to fix the problem. The plan is just a pile of paper without execution. The WRR is complete. So Allum’s mistake should now be repurposed: The bridge should have LR (if possible), active modes and busways, with no more than one lane of traffic each way. This would Increase capacity, reduce traffic problems and breathe life into the inner city. I hadn’t thought of the existing harbour bridge in that light before. but you’re 100% right regarding WRR being finished. Technically anyone wanting to by-pass the city should be on that motorway. Re-purposing the bridge with the centre 4 lanes for general cars only – one lane each way for bus only (light rail upgrade-able perhaps) and the outer lanes for bike/walking. No need for skypath (dollar savings) and 24/7 bus priority over the bridge! I watched the video of the cars coming off the motorway and can relate to this as I’m working on the construction site adjoining and have to cross with all my gear which can be quite difficult due to the speed of cars coming off the motorway.Then at end of the video there I am crossing the road. 🙂 That’s even better than seeing yourself on streetview. It took you nearly half a minute to be able to start to cross. A child wouldn’t have a chance. This is such an obvious place for AT to try out some cheap tactical urbanism. Maybe a lane-wide traffic island or just narrowing the road by a lane, to start with. Planters would do it. Every crossing is an adventure. Maybe the guy waiting on Union Street may turn across 2 lanes. Maybe someone is just about to come around the corner from Sale Street. Maybe the next guy coming around that off-ramp naively assumed you can take that off-ramp safely at 80 km/h. You just never know. Why doesn’t NZTA post exit speed signs before that off-ramp. Haha, I love it. I was glad to have you in the video! Only onsite when required however tell them to save one for the Surveyor. So you are! You even break into the street-crossing trot, an abnormal gait that has evolved for exactly this kind of situation. Actually Cook Street in 1928 looks pretty nice. I would go there. If we can get Smarter Pricing and NS Rail over the line I doubt a road AWHC will ever be built. Gosh that was an interesting post! Thanks. Did the purchase situation ever get properly clarified? Had AT sold the land (but denied it). Or had ACPL sold the land (but denied it). And what’s the rationale in this day and age for local assets being sold to NZTA for $1? Another nearby intersection with terrible / unsafe design is the corner of Sale and Wellesley Streets. If you’re walking along Wellesley here you are confronted with what must be the widest crossing for a 2 lane road in the city (according to google maps 40 metres!). Cars speed through the wide sweeping curve, that despite its scale still manages to be a blind corner as the design incorporates double banked rows of parking on one side (also unique, an old city works weigh scale from the 70s?). 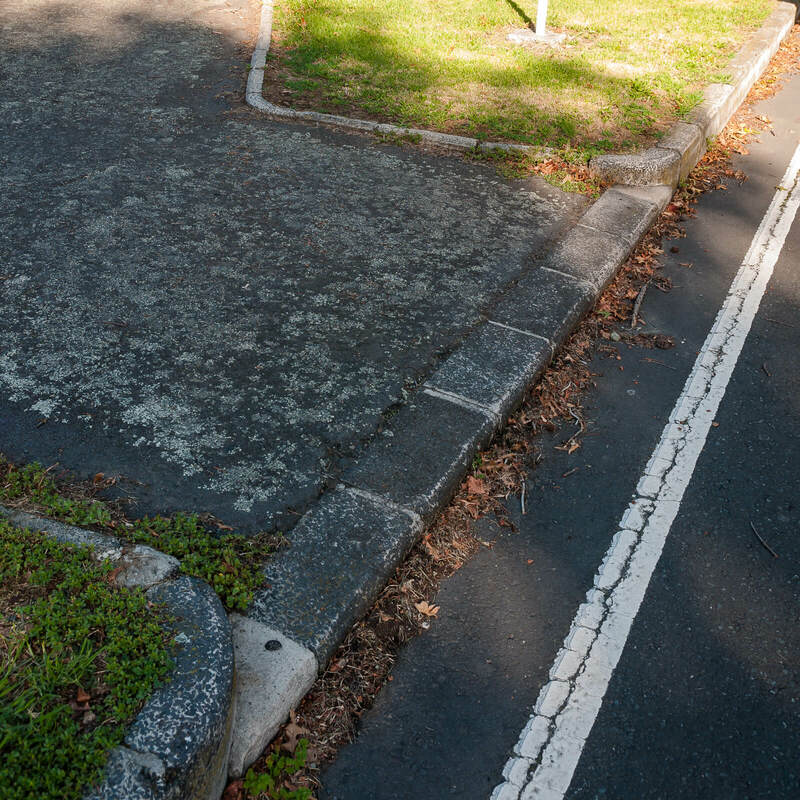 Pedestrians on the other hand don’t even get a lowered kerb on either side. It’s a really busy place to walk with bus stops, nearby cafés and Les Mills (upon crossing Wellesley St, which is equally bad with the right hand turns and no islands). The design however looks like what you get when you cross a motorway junction with a Westfield Mall carpark. I’d love to see a comment from our walking, cycling and safety manager Katheryn King on this area. Could you get an official comment or response from AT on their views and plans for the area in part 4 (or 5)? Great! Hopefully something will come out of that.